Apolipoprotein E (APOE) and elastin (ELN) are plausible candidate genes involved in the pathogenesis of stroke. We tested for association of variants in APOE and ELN with subarachnoid hemorrhage (SAH) in a population-based study. We genotyped 12 single nucleotide polymorphisms (SNPs) on APOE and 10 SNPs on ELN in a sample of 309 Caucasian individuals, of whom 107 are SAH cases and 202 are age-, race-, and gender-matched controls from the Greater Cincinnati/Northern Kentucky region. Associations were tested at genotype, allele, and haplotype levels. A genomic control analysis was performed to check for spurious associations resulting from population substructure. At the APOE locus, no individual SNP was associated with SAH after correction for multiple comparisons. Haplotype analysis revealed significant association of the major haplotype (Hap1) in APOE with SAH (p = 0.001). The association stemmed from both the 5' promoter and the 3' region of the APOE gene. APOE ε2 and ε 4 were not significantly associated with SAH. No association was observed for ELN at genotype, allele, or haplotype level and our study failed to confirm previous reports of ELN association with aneurysmal SAH. This study suggests a role of the APOE gene in the etiology of aneurysmal SAH. Non-traumatic, spontaneous subarachnoid hemorrhage (SAH) affects 16,000 to 17,000 individuals each year in the United States [1–3]. SAH has a 30-day mortality rate exceeding 40%, and surviving patients often demonstrate significant morbidity [2, 4]. Over 80% of SAH can be attributed to intracranial aneurysm (IA) rupture. Familial aggregation studies of SAH have consistently identified an increased risk of a first-degree relative with SAH or family history of SAH independent of smoking and hypertension . Variants of the apolipoprotein E (APOE) gene have been associated with Alzheimer's disease, lipid disorders and cardiovascular disease [6–8]. Previous studies have demonstrated that APOE ε4 and/or APOE ε2 are associated with lobar intracerebral hemorrhage (ICH) [9, 10]. We recently reported that haplotypes which include polymorphisms in the 5' untranslated region of the APOE gene are risk factors for lobar ICH . Specific to SAH, Kokubo et al. found significant association of APOE ε4 with SAH in a Japanese population. Niskakangas et al. reported association of APOE ε4 with adverse outcome after aneurysmal SAH. No study on other polymorphisms of APOE with regard to risk of SAH has yet been reported. In addition to APOE, the elastin (ELN) gene emerged as a putative gene for IA after linkage was found on 7q11, where ELN is located . However, prior association studies of SNPs in ELN have been contradictory and remain inconclusive [15, 16]. Further, few studies have been performed in US populations. We performed a case-control study examining the association of variants in APOE and ELN among a group of US Caucasians with SAH. The methodology of the Genetic and Environmental Risk Factors of Hemorrhagic Stroke study have been previously reported [5, 11]. Cases of potential ICH or SAH in the Greater Cincinnati and Northern Kentucky are identified by surveillance of 16 hospital emergency and radiology departments and through monitoring of hospital discharge diagnoses. Eligible cases are ≥ 18 years, are without trauma or brain tumor as the cause of hemorrhage, and reside within a 50-mile radius of the University of Cincinnati. A subset of cases was invited to enroll in a direct interview and genetic sampling arm of the study. The response rate was reasonable with over 60% of the cases agreeing to participate. Two controls for each interviewed case, matched by age (± 5 years), race, and gender were recruited from the general population through random digit dialing. Controls were informed of their participation in a risk factor study. Institutional Review Boards at each hospital approved the study, and informed consents were obtained from the participants. SAH was defined as non-traumatic abrupt onset of severe headache or altered level of consciousness associated with blood in the subarachnoid space on CT or at autopsy, or with a clinical history and examination consistent with SAH where xanthochromia and increased red blood cells are found in the cerebrospinal fluid. A total of 309 Caucasians were included for analysis, of which 107 were SAH cases matched to 202 controls. There was no significant difference in the average age of cases and controls (51.48 ± 12.93 yrs vs. 50.68 ± 12.23 yrs; p = 0.521) or gender distribution (64.4% vs. 64.8% female; p = 0.992) between the cases and the controls. We also genotyped samples from a small group of African American subjects. However, the limited sample size (24 cases and 43 matched controls) lacked sufficient power to identify associations. Thus, our results refer only to Caucasian cases and controls. Buccal swabs were collected from each participant at the time of interview, and DNA was extracted by standard methods. Genotyping for APOE ε2/ε3/ε4 alleles was performed by RFLP . For analysis of the SNP markers, genomic DNA was preamplified by whole genome amplification (WGA) using improved-primer extension preamplification. The WGA kit (High-Fidelity Expand Template System) was obtained from Roche Pharmaceuticals. Five nanograms of DNA was subjected to WGA and then diluted 50-fold, of which 2 μl was used for SNP genotyping. The WGA protocols are validated for analysis of genetic markers in our laboratory . The TaqMan™ (fluorogenic 5' nuclease) assay was used for SNP genotyping. The primers and probes were obtained from Applied Biosystems. PCR was conducted in ABI 9700 thermocyclers, and the end-point results scored using the ABI 7900HT Sequence Detection System. In each 384-well plate, two reference samples and two negative controls were included for quality control. We analyzed 12 SNPs spanning a 16 kb fragment on the APOE gene (Table 1) of which five upstream markers are now assigned locations on the TOMM40 gene . Physical distance between the most distal 3'SNP (rs10119) on TOMM40 and the most proximal 5'SNP (rs769446) on APOE is approximately 2 kb. These 12 SNPs were analyzed in our previous study on ICH, which showed haplotypic association with lobar ICH . We selected 10 SNPs on the ELN gene (Table 2), which were reported in previous association studies involving aneurysmal SAH [14–16]. (*) In Tables 1 and 2, the second nucleotide position under dbSNP ID represents the minor allele. Allele frequencies were estimated by gene counting. Conformity of genotype proportions to Hardy-Weinberg equilibrium (HWE) was tested by a goodness-of-fit χ2 test. Haplotype frequencies and probabilities of haplotype pairs for each individual were estimated by PHASE version 2.1. PHASE implements Bayesian methods for estimating haplotypes from population data . Allele and genotype frequency differences were tested using allelic and genotypic χ2 tests, respectively. Haplotype associations were tested using χ2 and haplotype trend regression (HTR) . 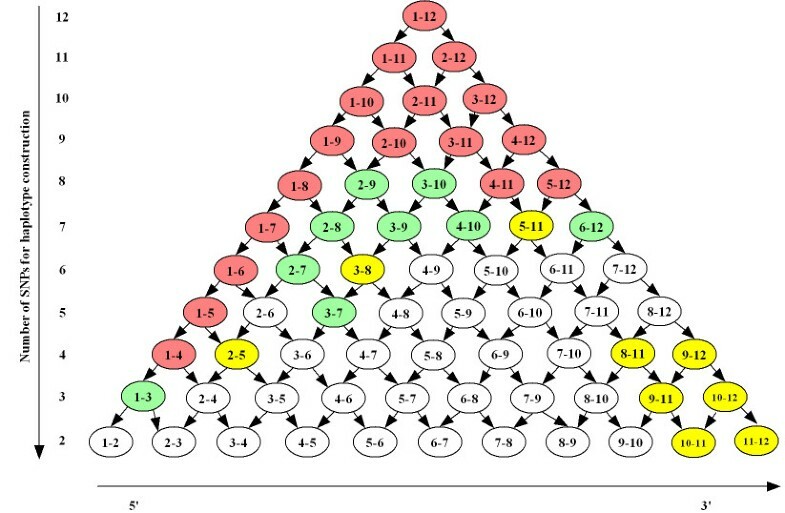 All p-values for allele, genotype and haplotype associations were empirically determined by Monte Carlo simulations as described by Becker and colleagues [22, 23]. Multiple testing was accounted for by testing a global hypothesis of no association for each of the single locus and haplotype test [22, 23]. We performed a genomic control analysis to adjust for population substructure . This was done by typing 30 unlinked SNPs distributed throughout the genome as null markers in all samples (cases and controls) and conducting test statistics to estimate λ following the methods as described . Genotype and allele frequencies among the cases and the controls are presented in Table 3. Genotypes at all 12 markers were in HWE. We did not observe significant association either at allelic or genotypic level (global p = 0.452 and 0.807, respectively). Marginal frequency differences between cases and controls at allelic and genotype levels were observed in SNP 1 and 4 (Table 3). We performed a separate analysis for the isoformic ε2/ε3/ε4 alleles, which also revealed no significant association (Table 4). Note: In Tables 3 and 6, Genotype 'aa' represents the minor homozygous genotype; the first row corresponding to each SNP marker presents the data on cases and the second row presents the data on controls. We conducted an analysis to test for association at the haplotype level based on data from all 12 SNPs (Table 5). Using PHASE, we observed a total of 66 haplotypes. In Table 5, we present data on 9 common haplotypes (frequency >0.02 in either cases or controls as inferred by PHASE. TGTCGATCCTTC (Hap1) was inferred as the most common haplotype, which accounted for 30% and 19% of all haplotypes in cases and controls, respectively. Global tests of association were significant for both χ2 test and HTR (p = 0.019 and 0.036, respectively). Among all haplotypes, Hap1 showed significant difference between cases and controls by both methods (Table 5). APOE haplotype frequencies inferred by PHASE and HTR and the corresponding p-values showing the levels of difference between cases and controls. p- CS : empirical p-values based on chi square test statistics, p- HTR : empirical p-values based on haplotype trend regression test statistics. To explore the haplotype association at a finer level, we conducted a 'sliding haplotype' analysis to decompose Hap1, the most common and significantly associated haplotype. None of the other haplotypes showed significant association even with the sliding window analyses (data not shown), and they were consequently dropped from further analysis. A graphical representation of this analysis is presented in Figure 1. The uppermost circle in the figure, with the number '1–12', represents Hap1 inferred using all SNPs (SNPs 1 to12). Progressively smaller windows of this haplotype were formed at each level of the pyramid. These depict windows created with combinations of SNPs used in haplotype construction for that level (e.g., circle 1–11 represents the most common haplotype formed by SNPs 1 to 11, circle 2–12 represents the most common haplotype formed by SNPs 2 to 12, and so on). Haplotypes with significant associations are shown in yellow (p ~ 0.05–0.1), green (p ~ 0.01–0.05) and red (p < 0.01). A trend of ascending significance is observed at the 5' region. Marginal associations are also observed at the 3' region, where SNPs encoding the isoformic ε2/ε3/ε4 variants are located (SNP10 and SNP12 together form the ε2/ε3/ε4 variants – cytosine at both sites result in the ε4 isoform, thymine at the first site and cytosine at the second site form ε3, and thymine at both sites yield ε2). Sliding Window Analysis of Hap1 (TGTCGATCCTTC). Each circle depicts the most common haplotype created by the SNPs indicated (e.g., circle 1–12 represents the most common haplotype formed by SNPs 1 to 12). Significance level of the most common haplotype is indicated by color: yellow (p ~ 0.05–0.1), green (p ~ 0.01–0.05) and red (p < 0.01). Global significance for sliding window is 0.013. Genotype and allele frequencies of ELN SNPs among the cases with aneurysmal SAH and controls are presented in Table 6. Genotypes were in HWE with the exception of SNP2 and SNP7. One marker rs13229379 (SNP6) was found to be monomorphic in our population and was thus dropped from subsequent analysis. None of the SNPs were associated with SAH. Using PHASE, we inferred haplotypes based on all 9 SNPs and did not observe significant associations (global p = 0.229 and 0.198; Table 7). There was no association of haplotypes even after excluding the two markers (SNP2 and SNP7) that were not in HWE (data not shown). Further, the sliding window analysis showed no association between ELN and SAH. ELN haplotype frequencies inferred by PHASE and HTR and the corresponding p-values showing the levels of difference between cases and controls. Although we did not observe significant association of the APOE variants and also could not confirm the association of APOE ε4 with SAH, we did find an association between SAH and the most common APOE haplotype, which occurred in nearly 1/3 of the SAH cases compared to 1/5 of controls. This haplotype included regulatory regions of the gene in the 5' untranslated region. Since variations of the 5' regulatory region are traditionally associated with decreased or increased expression of the gene, we hypothesize that regulation of APOE is the primary mechanism of association of this gene with SAH. We have not examined the 3' untranslated region and our most distal 3' SNP was within the last exon of the gene. Variations in the 3' untranslated region are associated with post-transcriptional processing and we are unable to comment upon variations in these regions. Our recent study in lobar ICH demonstrated that in addition to the association of APOE ε4 with lobar ICH, APOE haplotypes, which include non-coding variants in regulatory regions, mediate the risk of lobar ICH . These findings underscore the importance of regulatory variants, in addition to coding sequences, in understanding the genetic basis of complex diseases. Haplotypes have the advantage of providing information not only on the relationship of disease to a single polymorphism, but also on variants that are in linkage disequilibrium with the markers tested. The selection of large haplotypes may lead to "over-partitioning" in which haplotypes with very small frequencies may be spuriously associated with the phenotype in question. In our study, the most common haplotype was associated with the phenotype, making over-partitioning a less-likely confounder. The primary function of APOE in lipid metabolism is to mediate the interaction of lipid particles with LDL and APOE receptors. The involvement of APOE polymorphisms in lipid metabolism, Alzheimer's disease, and a host of cardiovascular and cerebrovascular diseases imply pleiotropic effects of the gene [6–8]. Although outcome studies have implicated APOE ε4 as a risk allele for cognitive impairment following subacute phase of aneurysmal SAH  and a recent meta-analysis showed marginal association of ε4 carriers with SAH , the biological role of APOE in the etiology of SAH remains unclear. Based on epidemiologic studies showing association of lower cholesterol levels to hemorrhagic stroke including subarachnoid hemorrhage [28–30], it may be speculated that lipid metabolism involving APOE contributes to risk of SAH or its adverse outcomes. A significant advantage of our study is the inclusion of polymorphisms other than those that code for APOE ε2 and APOE ε4. The overall haplotype spans a large region of the 5' untranslated region and the exons of the APOE gene, which allows for an examination of the regulatory regions. The sliding window analysis provides a compelling indication of association, which emerges from the 5' region of the gene. To our knowledge, no other study has examined any other SNPs of the APOE gene and risk of SAH. The association of ELN with SAH has not been consistent. Using an affected sib-pair design, Onda et al. first reported linkage of familial IA to chromosome 7q11 in Japanese families. The putative locus was later confirmed by linkage in a set of extended pedigrees from Utah . However, two other linkage studies, from Japan and Finland, did not replicate these findings [32, 33]. A putative candidate gene, ELN, which maps to 7q11, raised the expectation of its association with IAs. Although we did not find significant association either at allelic or haplotype levels, we do not to rule out the possible association of ELN with SAH. Differences in allele frequencies and haplotype structures among populations could influence association results. The allele frequencies for many SNPs in our population were different from those reported in the Japanese population . Further, an associated polymorphism could be in LD with the functional variant and not be the functional variant by itself. Variation in LD pattern across populations, therefore, would be important in assessing association. Case-control association designs should be viewed with caution because spurious association could be introduced by unrecognized population substructure. To guard against such false associations, we used a genomic control approach in which null markers distributed throughout the genome are used to adjust the association test statistics . The adjustment is carried out by estimating a variance inflation factor, λ, from the distribution of the test statistics at the null loci. In the absence of substructure, λ is 1 and the genomic control approach is equivalent to a standard case-control test. A major strength of our study was that we used genomic control to evaluate and correct for any population substructure in our samples. The λ value obtained form the 30 null SNPs was 1.06. This clearly illustrates absence of any major population stratification in our samples, which suggests that our results of association or lack thereof remain valid. In conclusion, our study suggests a plausible role of the upstream regulatory region of APOE in the etiology of aneurysmal SAH. The complexity of the biological mechanisms underlying ELN in conjunction with genetic heterogeneity among ethnically diverse populations could influence our observed lack of association. Further studies with larger sample sizes and in additional ethnic groups are required to establish the likely involvement of ELN variants in SAH. This study was supported by funding from the National Institutes of Health, USA (National Institute of Neurological Diseases and Stroke grants R01-NS36695, R01-NS30678; and National Institute of Environmental Health Sciences grant R01-ES06096). RK, PP and HX carried out the molecular genetic analysis, data analysis and participated in the preparation of the manuscript. MH, LS were involved in the study conception, data management, quality control and recruitment of subjects. CM was the principal data manager, and involved in conceiving the variable definitions, data cleanup and baseline statistical analysis. PS was the principal statistical analyst for the non-genetic variables. BK, DK and MF were involved in conceptual study design, critique of the analyses and manuscript preparation. DW, JB, RC and RD were involved in conceiving and designing the study, preparation and final revision of the manuscript. All authors read and gave approval of the version to be published.